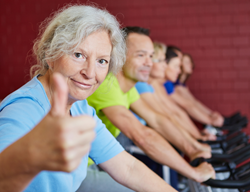 Chemist Direct finds new evidence that inactive post menopausal women have an increased risk of early death irrespective of other chronic health issues. One of the leading causes for almost every health problem is a lack of physical activity. One of the leading causes for almost every health problem is a lack of physical activity from cardiovascular disease to obesity, diabetes and mental health issues, but even for those who do include daily exercise, if a majority of their time is spent in sedentary activities the potential health risks remain a threat to longevity. The evidence of the increased risk of chronic diseases with those living a sedentary lifestyle was highlighted in the latest cohort study conducted by Cornell’s College of Human Ecology and other US institutions and led by Rebecca Seguin, assistant professor of nutritional sciences. Recruits from the Women’s Health Initiative Observational Study and Extension Study were given questionnaires and asked about the total hours spent in sedentary behaviour, doing physical activity, and other characteristics that portrayed the daily activity levels of these women at the start of the study. Researchers found that those who spent more than 11 hours of daily sedentary time had a 12 percent increased risk of developing chronic illnesses and suffering premature death due to cardiovascular disease and cancer. In the January edition of the American Journal of Preventive Medicine http://bit.ly/1dBE6fB where this study was published, it was noted that a continued association to risk for postmenopausal women remained even for those who completed the recommended amount of physical activity yet remained sedentary for the majority of the day. "The assumption has been that if you're fit and physically active, that will protect you, even if you spend a huge amount of time sitting each day," said Seguin, " when in fact, in doing so you are far less protected from negative health effects of being sedentary than you realize." With the advent of modern technologies it becomes increasingly easy to complete all daily activities from the comfort of being seated, and as adults reach the retirement age, the amount of time spent in sedentary entertainment becomes an added risk to health care. The researches recommended older adults, especially women who remained the most at risk, to find active hobbies or activities that require longer periods of standing, and during seated activities it is advisable to get up every 30 minutes to diminish the risk factors mentioned in this study.